Government transparency is an important concept, and the change to email would result in the loss of a tremendous amount of documentation. This is even more important when a Secretary of State has outside conflicts of interest as Clinton did. Members of both parties had concerns when Hillary Clinton was made Secretary of State. The Obama administration instituted stricter rules regarding email in 2009, and made an agreement with Clinton to disclose all the donors to the Foundation when Secretary of State. There were two things which Clinton was supposed to do, and she ignored both. She then proceeded to unethically make decisions regarding parties which had made substantial contributions to the Foundation. In addition, Bill Clinton received extraordinarily high speaking fees from such parties. This is especially foolish considering that she knew how much scrutiny she would be under, and presumably thought she might run for president again one day. If you are not doing something dishonest, it only makes sense to follow the rules and keep your nose clean in such a situation. Apparently she thought the money was worth the risk. This week, the inspector general of the nation’s intelligence agencies, I. Charles McCullough III, informed members of Congress that Mrs. Clinton had “top secret” information, the highest classification of government intelligence, in her account. Some of that information, according to a memorandum the inspector general sent to the heads of the Senate and House intelligence and judiciary committees, may have come from a program called Talent Keyhole, which relies on satellite intercepts of conversations or imagery data. The program involves some of the most secure information in the intelligence agencies’ computer systems. The investigation into Mrs. Clinton’s emails has its roots in her decision to use only a private email account for her official business when she was secretary of state, an unorthodox decision that gave her some control over what was made public. She faced criticism when her use of the account became known this year, and after deleting what she said were more than 31,000 personal emails, she turned over more than 30,000 work-related emails for the State Department to make public. 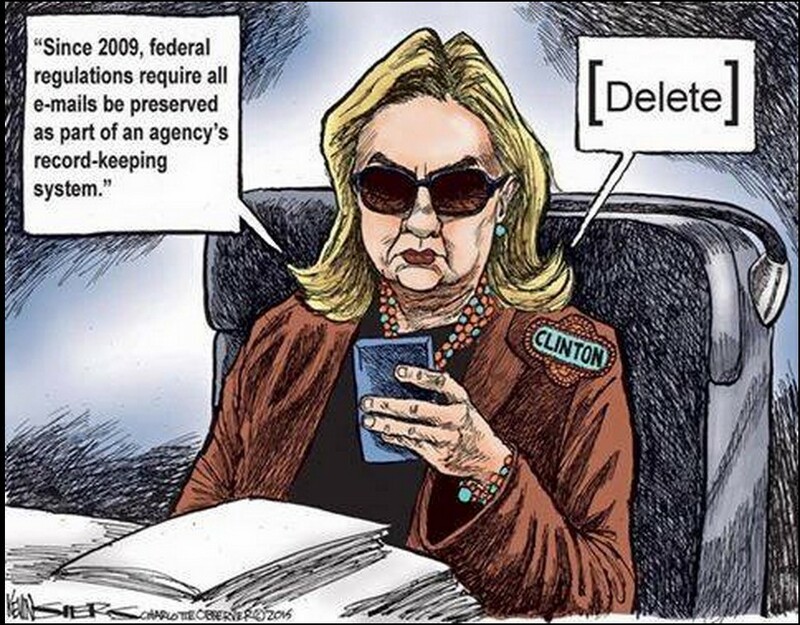 We already know that some of the over 31,000 emails which she deleted turned out to relate to Libya and terrorism, and some of the email which was turned over appeared to be altered, contradicting her claims of the email being personal. The classified email found so far in this sample of only forty emails were in email received by Clinton and not sent by her. This does not really alter the underlying issue of Clinton’s violation of government policy leading to classified email inappropriately being on her home server. As I have previously discussed, the Obama administration has been hard on any violations of policy regarding classified information. Clinton was responsible for the information being on a private as opposed to secure government servers due to her failure to follow government policy, regardless of whether she had any intent for this to occur. If Hillary Clinton were to be treated consistently as others have been treated who mishandled classified information (which I suspect will not be the case), she would be indicted. On the other hand, despite many conservative bloggers who dream of her going to prison, those indicted in situations comparable to her have been able to negotiate plea bargains which led to probation, fines, and loss of security clearance. It would create an awkward situation should Clinton be stripped of her security clearance and then be nominated by a major party as a candidate for president. The FBI’s interest in Clinton’s e-mail system arose after the intelligence community’s inspector general referred the issue to the Justice Department on July 6. Intelligence officials have expressed concern that some sensitive information was not in the government’s possession and that Clinton’s unusual e-mail system could have “compromised” secrets. The issues around Clinton’s e-mails have also intensified as it has become clear that a number of her statements defending her actions now appear to be false. As she did that Sunday in Iowa, Clinton has said multiple times that she never sent or received any e-mails containing information that was classified at the time. The controversy highlights one of the problems with Clinton’s decision to use her own e-mail system during her four years running the State Department. At many agencies that handle sensitive information, discussions of classified material and sharing of classified documents must take place on specially secure classified computers. The government protections don’t extend to private accounts. Other Cabinet secretaries have been known to use private accounts, including one of Clinton’s predecessors, Colin Powell.